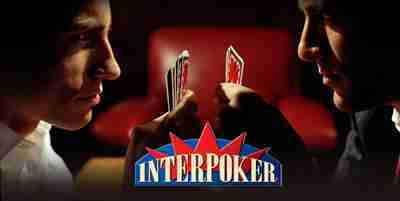 InterPoker is proud to offer a poker room that is completely robot free. In order to balance the tables and start new games we are prepared to pay you instead! Every player who registers an InterPoker account and has more than $20 in his or her account is eligible for a prop player invitation. 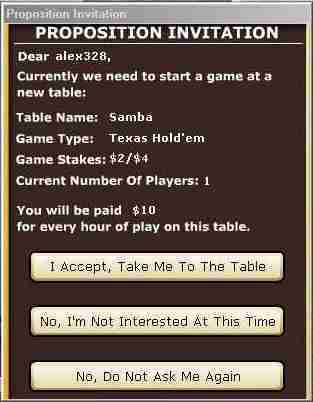 When invited you will see a pop up message (see screenshot below) telling you which table needs to be started, the limit of the table, and the amount we are prepared to pay you to play on that table. Payment will start as soon as play begins. The amount you are paid per hour will depend upon which table the system sends you to. You will not be sent to a higher limit table if you have insufficient funds in your account for the buy in. Proposition play comes to an end in one of three circumstances. 1. If at any time you leave the table, or sit out from play. 2. When four or more players have joined the table. 3. When two hours have passed. When the proposition play has ended you will see a pop up message telling you the amount of money that will be credited to your account. You will then receive an email confirming this amount. If you do not wish to received proposition invitations simply click on the "No, Do Not Ask Me Again" button. This decision can be reversed by clicking the appropriate checkbox in the Options screen.